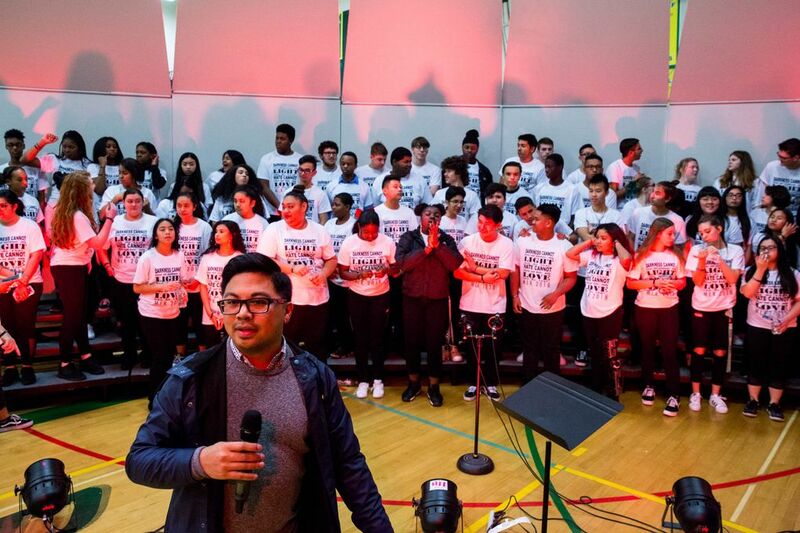 Students at Kentridge High School inspired classmates during a rally ahead of Martin Luther King Jr. Day. The event was one of several rallies held by students at Kentridge and Kent-Meridian high schools ( Ramon Dompor / The Seattle Times). 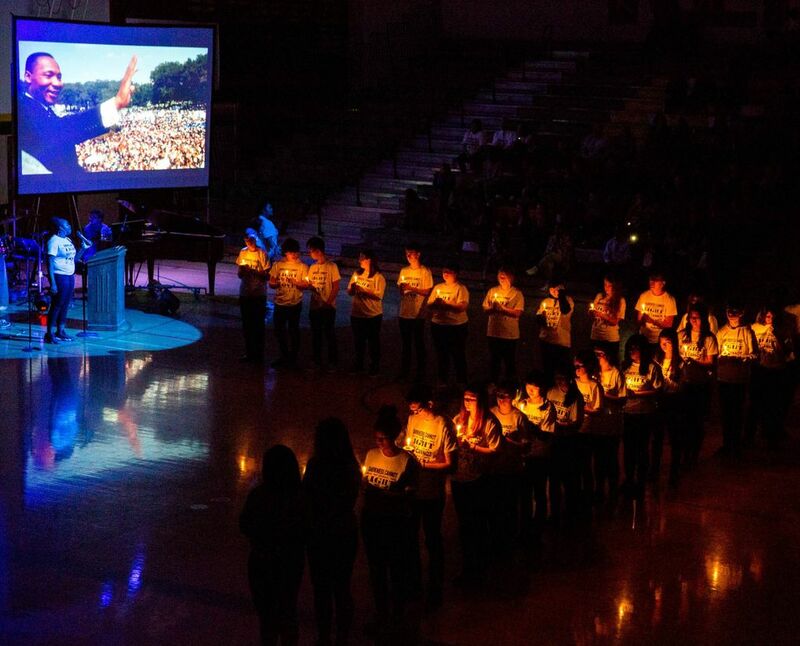 After a year of budget crunches and racial tension, a multi-media, gospel-inflected rally honored Martin Luther King Jr. and let Kent students — from football players to choir kids to transgender students — discover more about themselves. 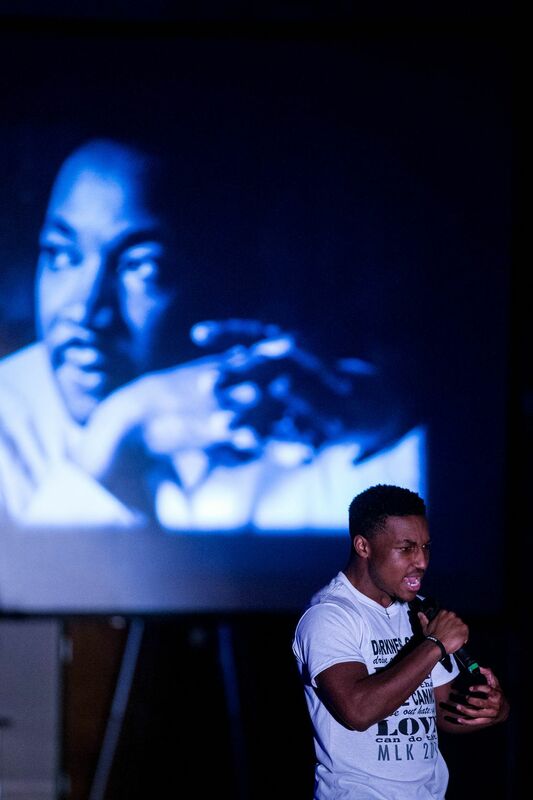 On a recent weeknight, roughly two hours before this year’s Martin Luther King Jr. rally in the Kentridge High School gymnasium, a couple of hundred people — most of them high-school students — bustled around with enough anxious, opening-night energy to power a small town. It was a roil of happy, tense, barely controlled chaos. 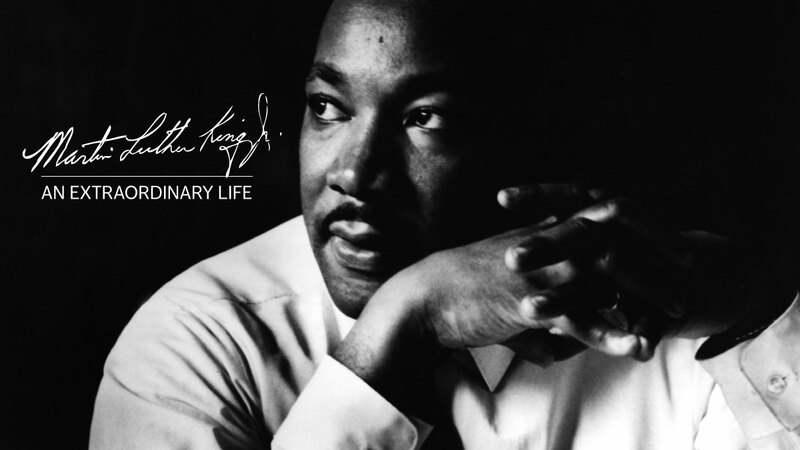 Explore our tribute to Martin Luther King Jr., collecting the story of his life; photos of the times in which he lived; and perspectives from politicians, activists and ordinary citizens on his tremendous legacy. What does ‘institutional racism’ mean? 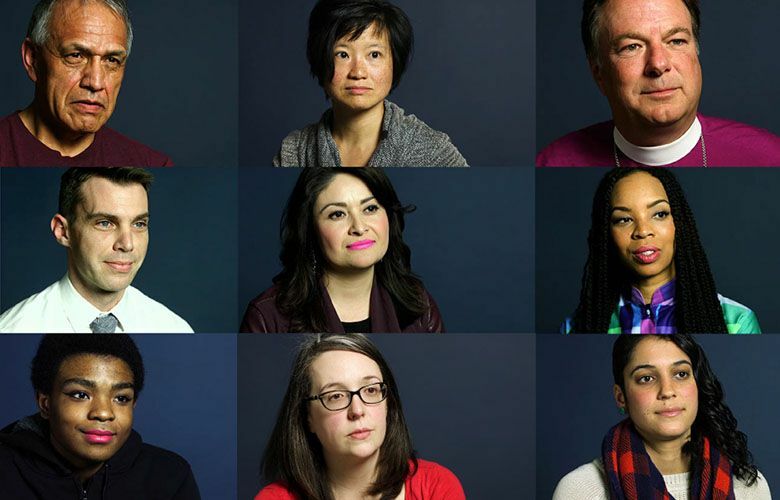 We asked 18 people to discuss terms about race. View the project. What’s open, closed Monday for MLK federal holiday? 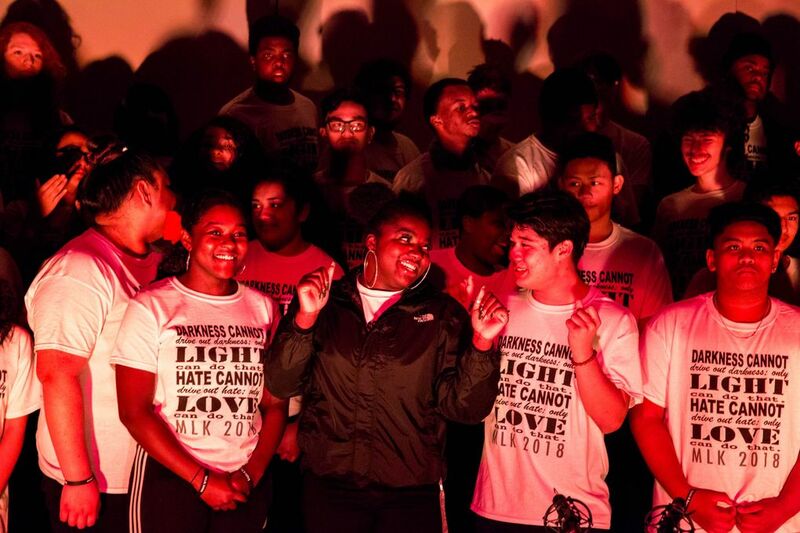 Teachers and visiting artists tried to stay poised as they conferred over last-minute details as performers from two high schools — Kentridge and Kent-Meridian — came together for the first time to co-perform their gospel-music/spoken-word rally about the fraught relationship between social justice and social media. 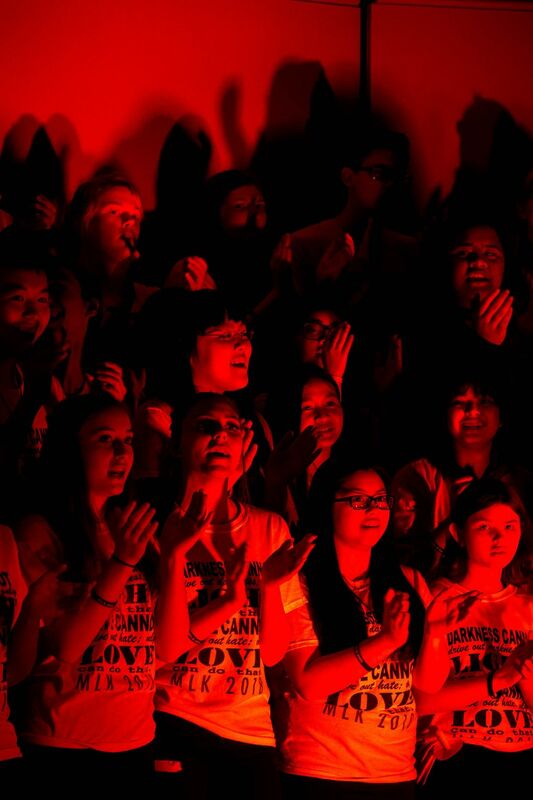 A few students kept their cool, sitting calmly in the bleachers or standing on the stage, but most could barely contain themselves. Instead, she said, it’s a place where students are discovering each other, and themselves. 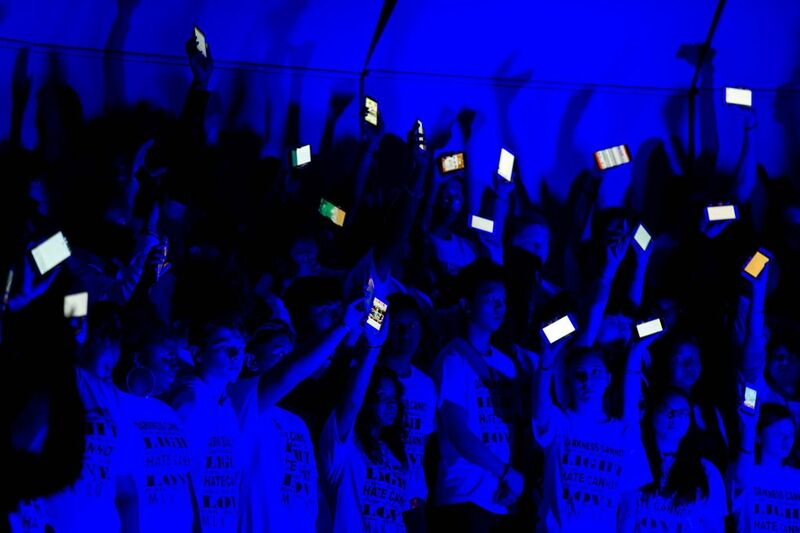 This year’s rally, held last Thursday, was a multimedia, student-driven project — with help from Kentridge and Kent-Meridian teachers, plus teaching artists from The 5th Avenue Theatre and the local gospel-music scene — about social justice and social media. 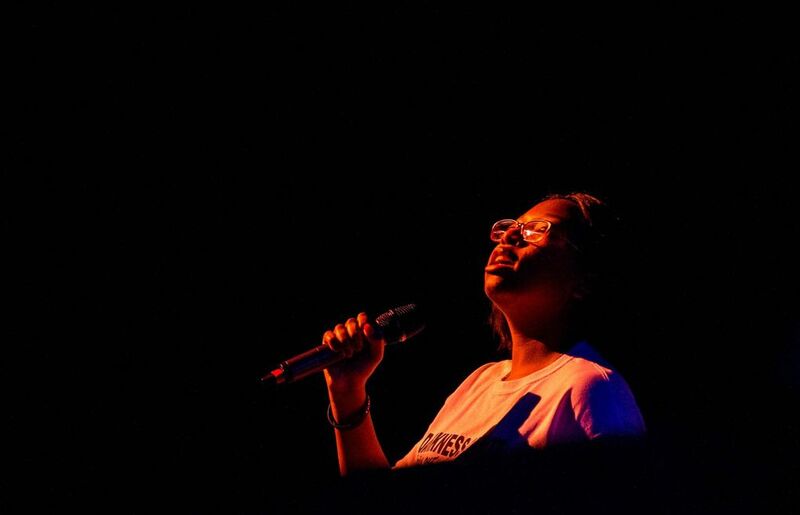 No matter how the audience would react, she said (and others concurred), this year’s MLK rally brought together students from hugely different demographics: football players, theater kids, choir kids, special-needs students, musicians, members of the Gay Straight Alliance, transgender students, students who sing in church and students who don’t go to church. 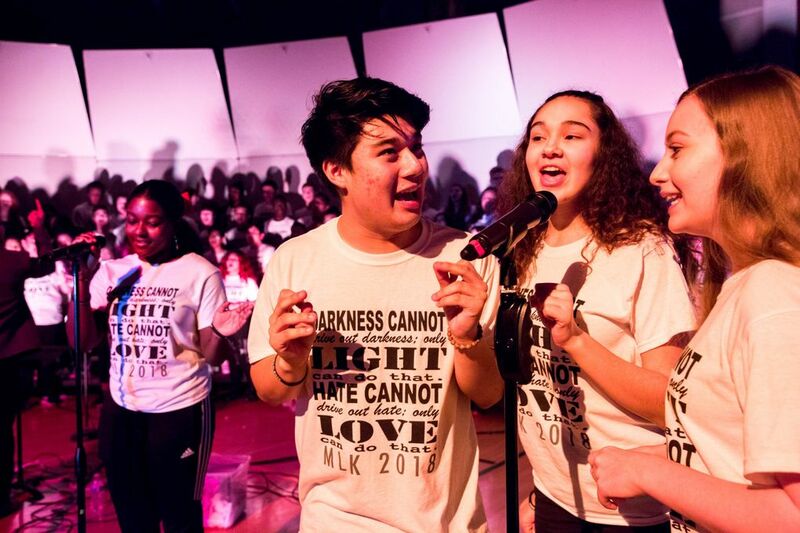 This year’s MLK rallies — some daytime rallies at Kentridge and Kent-Meridian high schools last week, plus that Thursday evening event for the community at large — come after a tough year for the school district, which has faced everything from budget crunches to racial tensions. In May, Superintendent Calvin Watts said the district had started the year with a $3.8 million balance when it really needed $15 to $18 million, and he imposed a spending freeze. 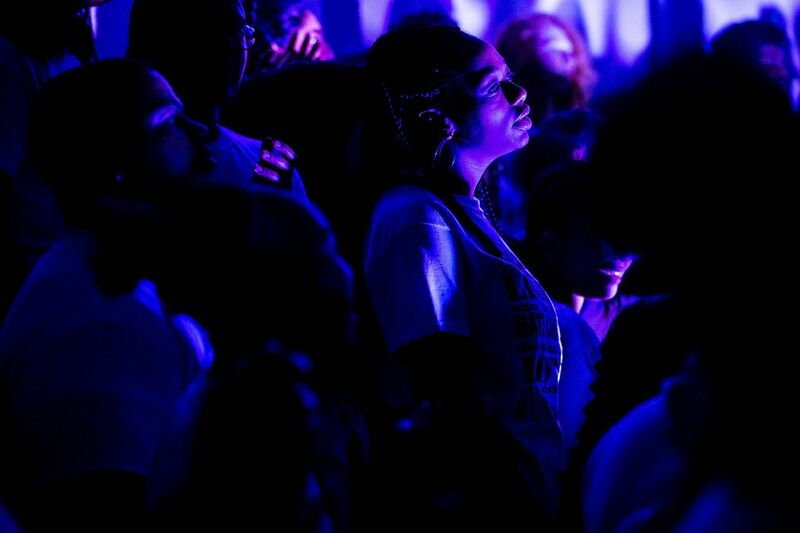 On Thursday night, as Watts sat in the stands with his wife, Robbye, before the rally, he nodded toward the stage, where the roughly 200 students were beginning to assemble themselves on risers. Grajewski, the Kentridge drama teacher who came to the district in 1990 and is known as “Miss Jenny” or “Miss G” to her students, said dozens of languages are spoken at the two schools and sometimes students fight over geopolitics: Sikh and Muslim students beat each other up, or young immigrants from countries at war with each other get in fistfights on the bus. The issues for her students — on a day-to-day, on-the-ground level — aren’t just headlines. They’re real. 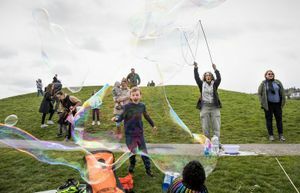 Some of the wealth disparity is borne out by the numbers: This year, 29.6 percent of Kentridge students were in the free or reduced-price meal program (well below the districtwide average of 47.9 percent), as opposed to Kent-Meridian’s 65.2 percent. But she agrees with Superintendent Watts that the diversity of the Kent district reflects the diversity of the world. “When you walk into our lunchroom, it’s like the United Nations,” she said. 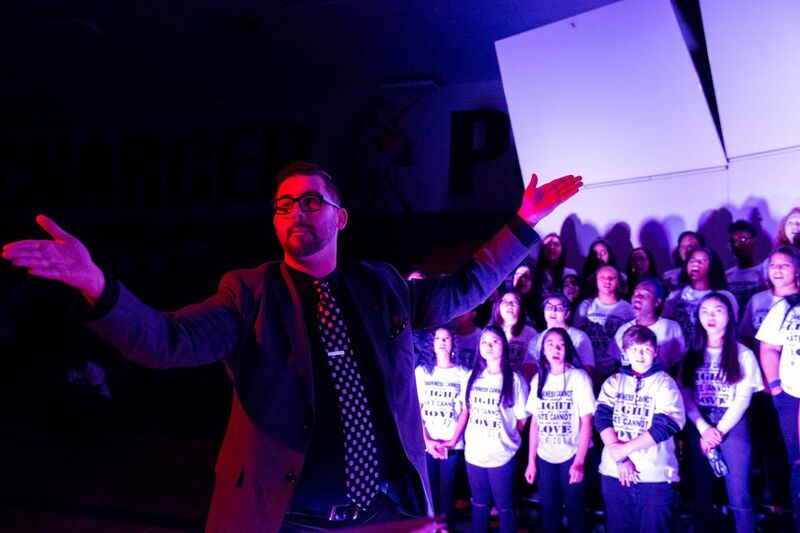 While Thompson, Grajewski and others conferred over final touches on the rally, the students kept buzzing with jittery energy — pacing, running lines, doing high kicks on the gym floor. Rahzia Johnson, a student about to perform “Keep on Scrolling” (her spoken-word piece about police shootings and the online distractions that live in her phone) learned a friend had just shown up. She ran through a door shouting “Isis! Isis!” but was quickly accosted by Shaunyce Omar, a gospel and musical-theater singer and one of the rally’s teaching artists from The 5th Avenue Theatre. Meanwhile, a swell of new, slightly puzzled faces had been gathering in front of the locked gym doors: parents, siblings, fellow churchgoers, neighbors. They weren’t sure what was going to happen, but they’d heard the students talking about it for months. “I have a feeling it’s going to be nice,” said Lynaia Fua-Lologo, a middle-school student who came to support one of her friends. A few minutes later, students unlocked the gym doors, and the new folks — from Fua-Lologo to Superintendent Watts — flooded in. The house lights dimmed and the spotlights lit up. 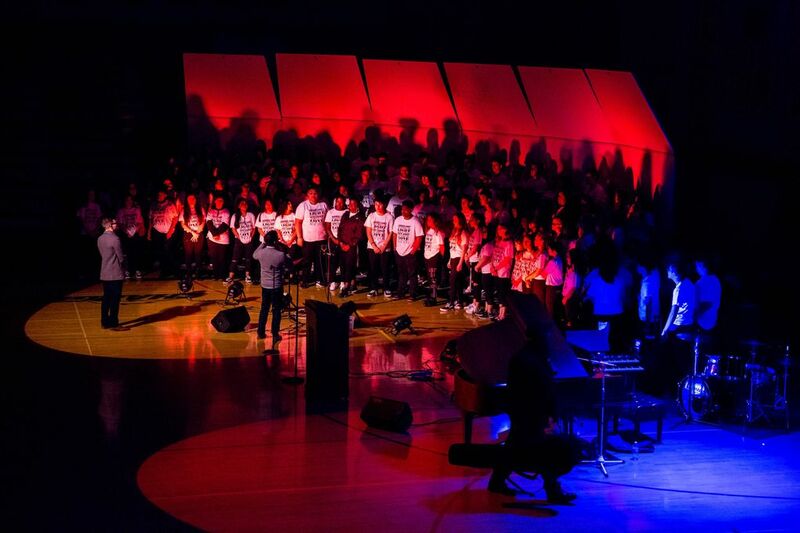 The students sang passionately, their combined 200 voices in a velvety boom. One student recited part of a King speech about nonviolent direct action before the soundscape drowned him out with familiar-sounding digital message alerts (Facebook, Twitter, text-message pings). Johnson delivered “Keep on Scrolling” (“social media is the distraction, it ain’t bringing a revelation … we would rather drown out the cries for help and justice with some celebrities tweeting about their ‘perfect vacations’ ”) before throwing a cellphone across the gym floor. The adults seemed a little perplexed. 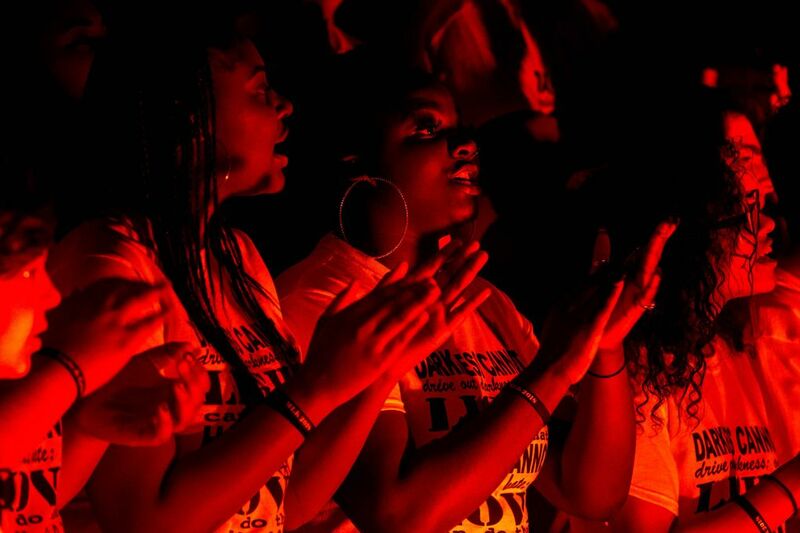 A few clapped their hands to “This Little Light of Mine.” A few others stood to sing along with “Lift Every Voice and Sing.” But it was clear the passion, the drive, was not in the audience, but in the students. And that, in the end, seemed like the point. Earlier in the evening, before the audience showed up, Kentridge student Kareena Scott sat in a quiet corner of the theater, across the hall from the gym, with a few friends, away from the preshow commotion. Her friend Myonna Burns, who had been preoccupied with her phone, looked up. Brendan Kiley: 206-464-2507 or bkiley@seattletimes.com.